When the CWR Board of Directors recruits new board members each year, we are reminded of the benefits of board service. I was contacted by a board member after I expressed interest in joining the board on a conference evaluation. Serving on the CWR board from 2013 through 2018 has been a wonderful journey with opportunity for professional growth, leadership and camaraderie. These were exciting and challenging times for our organization. When I began on the board in 2013, we were known as the National Communicators Network for Women Religious (NCNWR). By 2014, we had widened our vision to expand international membership and, thus, at our Twentieth Anniversary Conference we took on a new name—Communicators for Women Religious—and introduced a new logo. For the next two years, CWR received grants from the Conrad Hilton Foundation that enabled us to develop a new four-year strategic plan to grow the organization, to update our structures and services and to hire additional staff members (both full and part time.) These exciting steps made it clear to us, as a board, that there is an exciting future ahead for CWR! While I have had positive experiences serving on other non-profit boards, my CWR board experience has proved to be the most in-depth journey of all – it has focused on the shared passion for our professional mission. As CWR advances, leadership continues to glean the wisdom of the entire membership. • I have been blessed yearly to serve with amazing professionals dedicated to their work with and for a myriad of congregations of Catholic sisters. • I have been blessed with wonderful friendships and teamwork among board members; and I had opportunities to travel to different regions of the U.S., and Canada, where, as a group, we surveyed the venue for the annual conference and dedicated precious time to evaluate, plan and accomplish much for the ongoing good of the organization. • I have received much by learning better ways to advance the mission of Catholic sisters, and to be the best team player I can be, communicating for my own congregation and for the family of Catholic sisters regionally, nationally and globally. • Because I had the privilege to serve for six years, I have worked on and chaired a wide variety of NCNWR/CWR committees: Marketing Committee; CWR Treasurer and Finance Committee; Executive Committee; Strategic Plan Implementation Committee; and Nominating Committee. • In each committee experience, I worked with creative and dedicated CWR members. Each committee stretched me and filled my “bag of tricks” with so many more best practices than I could ever have explored on my own – listening to and learning what motivates and inspires our CWR membership; diving beyond the print world and into social media; planning marketing campaigns; gaining firsthand experience for organizational budgeting and investments, accounting, oversight responsibilities and legal implications of operating as a non-profit – just to name a few. The goal of board service is to bring to the table a variety of skills and expertise that enrich the vision and mission of CWR. The number of committees and projects is not the criteria or goal, but, like the “multiplying of the loaves and fishes,” each person and committee comes with resources and feeds all who come to the table. In completing these six years, I am grateful to have served with 36 professionals, including 32 women, four men, six other Catholic sisters and four executive teams. I have benefitted from the services of our excellent staff and enjoyed chairing three different committees that were animated by a total of 20-plus CWR members and their networks. I am very grateful for this enriching experience of working with so many individuals. 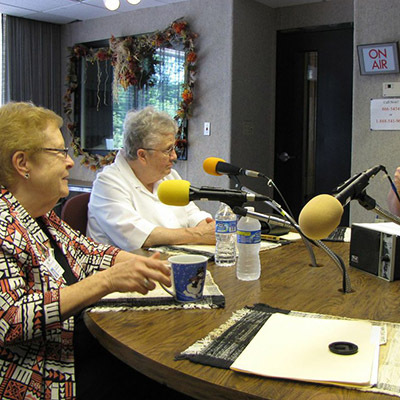 It’s all about bringing our gifts together to advance the mission of Catholic sisters. It’s about enjoying the exchange of ideas, forming relationships and building community. And it’s about collaborating and being accountable for the strategies to advance the mission. It can be an exciting and fulfilling experience. Through the privilege of serving on the CWR Board of Directors, I have witnessed that the organic reality of CWR, for all members, is reflected in the following prayer. with our dreams and prayers at the center. in the persons we meet and in all living things. of this sacrament of friendship.